Selected Works in Organic Chemistry focuses on the processes, methodologies, reactions, and approaches involved in organic chemistry, including analysis of diazo compounds and infrared absorption spectra. The publication first offers information on the method of synthesis of aromatic organomercury salts; method of synthesis of symmetrical aromatic organomercury compounds; and diazo method of synthesis of aromatic organomercury compounds with negative substituent in nucleus. The reaction of aliphatic diazo compounds with mercury salts and synthesis of organotin compounds through diazo compounds are also discussed. The manuscript takes a look at the synthesis of aromatic organometal compounds of bismuth through diazo compounds; synthesis of aromatic germanium compounds through aryldiazonium tetrafluoroborate; and reduction of organomercury compounds by bivalent tin salts as a method of synthesis. The text also examines the activation energy of the disaggregation process of associated alkoxy titanium derivatives and determination of positions of substituents in ferrocene compounds by means of infrared absorption spectra. 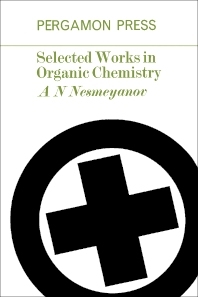 The publication is a valuable reference for readers interested in organic chemistry.